Erno, the river whose name links the company to its origins. Excellence, built on research and innovation. Ethics, because transparency is more than a value. Ecological sustainability, always looking towards the future. Herno was founded in 1948 in Lesa, on the shores of Lake Maggiore, by Giuseppe Marenzi and his wife Alessandra Diana. It was just after the war and Giuseppe, having lost his job after years of working for Siai-Marchetti, which produced aeroplanes during World War II, sought a new job with a company that manufactured raincoats. Even though they were not actively recruiting, Giuseppe was hired. To make cotton waterproof, they used castor oil, the same substance used in making military aviation fuel, and it was thanks to his previous experience that Marenzi was able to supply the raw material that the business needed, not only to continue operating, but to actually increase its production. It did not take long for him to move from that job to establishing his own business. The climate around Lake Maggiore is extremely humid and rainy, so well made raincoats are in demand. Herno was thus founded on the basis of opportunity, intuition and inventiveness. Its story starts with water; water from Lake Maggiore and the river Erno, which runs close to the company and gives it its name. It is a company that is still firmly connected to its roots. 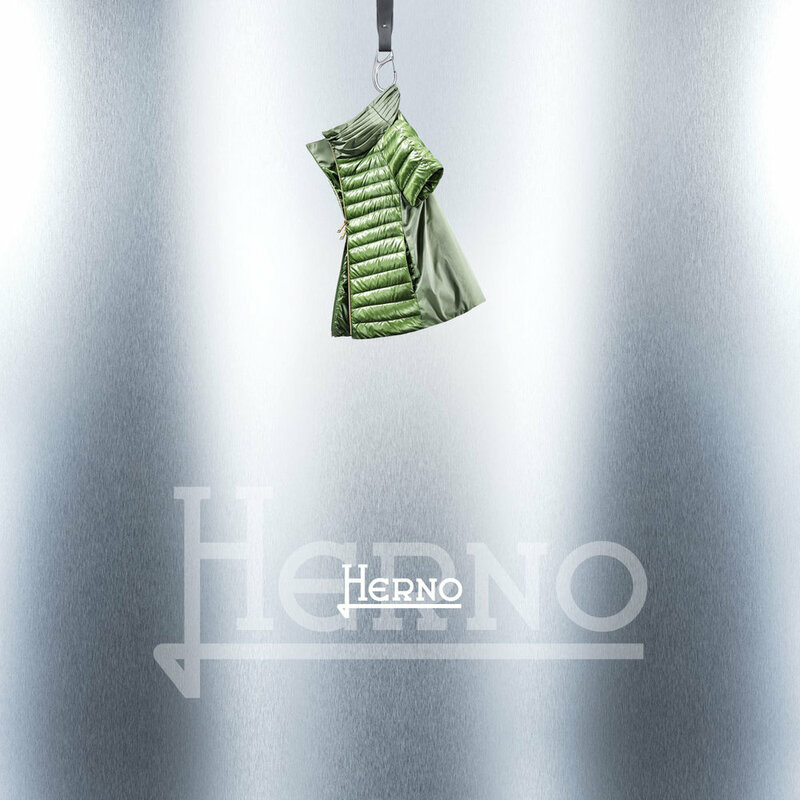 Raincoats, first for men and later for women, were Herno's first products. Then in the 1960s, cashmere coats were added with a focus on double-faced items and exports within Europe started during the same period. The collection diversified in the ten years that followed, and for women, it included jackets, suits and dresses too. In 1971, Giuseppe Marenzi was among the first in Italy to expand into the Japanese market opening the first Herno boutique in Osaka. The 1980s were spent consolidating its collections and markets and entering the new, strategic market of the United States. The company's know-how was valuable to the leading brands who were affirming their presence in the international markets and decided to entrust the production of their garments to the Lesa- based company. Production for third party brands characterised the 1990s along with activities to develop the Herno brand. Giuseppe Marenzi's story is followed by that of his son, Claudio, who is the current President and Managing Director of Herno. He joined the company in his early twenties, starting in production, moving on to the sales and marketing department and then to strategy. 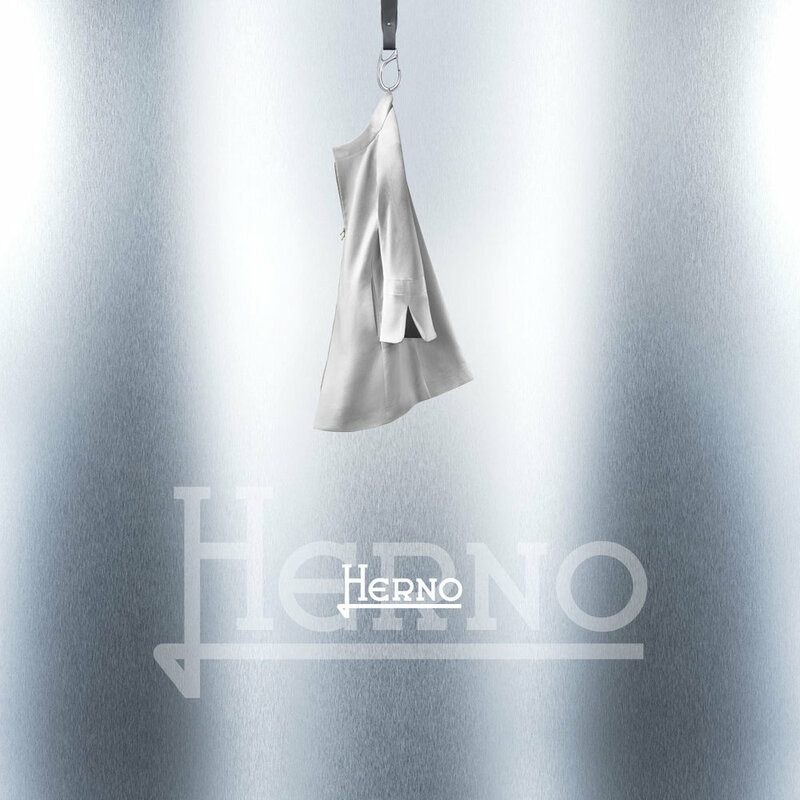 He was the one who led the changes that the business underwent in the years following 2000: the business needed new direction and, taking inspiration from the past, the Herno brand once again became the company's strategic focus. As the youngest of Giuseppe Marenzi's 3 children, Claudio Marenzi understood every aspect of his profession, even the most practical aspects of dressmaking, and it was only through observing and learning how the product was made and finished, and by appreciating its distinctive qualities, that he was able to recognise the need for a significant change in strategy that would permit an increased turnover of this family-run business. This strategy brought a new vision to the company and motivated young talents as well as introducing a more streamlined and efficient organisational structure and a winning business model. The results are clear from the exponential growth: turnover has almost doubled in the last two years, and the Herno brand is now an ambassador for luxury Italian goods in the world's leading stores, with 70% of revenue coming from exports. The product is at the heart of the brand. It is the fruit of the ability to create and innovate to reach the perfect balance between functionality and aesthetics for which the collections are known. Herno's outerwear garments, made for modern consumers, are symbols of exquisite workmanship and excellent taste. 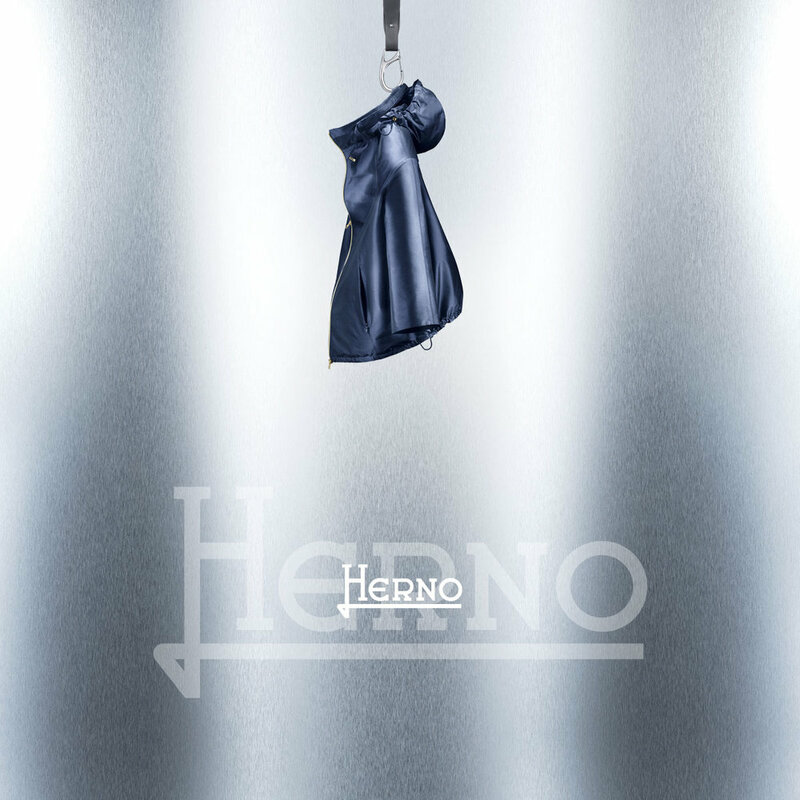 Stylistic coherence and garments that result from that exquisitely Italian ability to create products of the highest quality are the distinctive traits of the Herno clothing brand. They are products that come from a factory conceived as a creative centre where tradition and modernity coexist. Producing a "well made" coat is not enough to be a leading player in the market: studying the details has become a philosophy; high technology is the value added to a sartorial urbanwear concept that never ignores the past. Thanks to research and innovation, increasingly high-performance textiles are constantly being introduced. Revolutionary production processes operate alongside traditional methods, while particularly innovative machines perform heat-bonded taping and ultrasound stitching: these methods allow the use of extremely fine down, the prestigious double emblem of handmade products and pieces made without traditional stitching. It is a new way of thinking about manufacturing that guarantees that level of excellence that is not just a target to be achieved, but is the very essence of each Herno garment. Herno's production is founded on garments that express the essence of being Italian, on absolute quality and the skills of its employees, but Herno's fundamental philosophy is based on ethics. The down used is sourced from 2 locations that are very different and far apart: Siberia and the Italian valley of Lomellina, whose entire output is used in Herno clothing, in honour of the origins of Claudio Marenzi's mother, Alessandra. But ethics also mean stating openly that the nylon coats are made in Romania, and not in Italy, albeit in sites controlled directly by Herno S.p.A.
All the sites in Lesa are camouflaged into the landscape, with complete sympathy for the surrounding countryside, respecting the harmony of the mountains that surround the town. The nineteenth-century factory, completely restructured thanks to investment in photovoltaic technology, is entirely self-sufficient in terms of energy requirements, which have been gradually reduced by purchasing low energy consumption machinery. In recent years, the continuous renewal of Herno's production systems and services has brought about a series of improvements in terms of safety and the working environment, as well as in technological innovation and modernisation of the factories: this process was intended to develop awareness among the employees that working in compliance with safety procedures improves the working environment and the performance of tasks.